Saturated fatty acids: These are found in the carcases of animals that are dressed and prepared for food, and its derivatives such as milk, eggs, and cheese. They increase cholesterol production in the body and is known to cause the most common form of arterial disease, called arteriosclerosis, in which unused cholesterol (LDLs) is deposited in the inner wall of the arteries, narrowing the blood vessel and eventually restricting the flow of blood from the heart to the body. 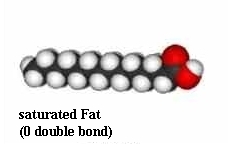 Saturated fat (animal fat) is fat that consists of triglycerides containing a greater portion of saturated fat; and it has no double bonds between the individual carbon atoms of the fatty acid chain. That is, the chain of carbon atoms is totally "saturated" with hydrogen atoms. This chemical structure cause saturated fat to have a high melting point. Hence, more energy, in the form of heat, is required to break the bonds and melt the fat. In cellular metabolism, saturated fatty acids decrease the fluidity and permeableness of the cell membranes, especially the areas on the cell membrane which are called insulin receptors. The impermeableness of the cell membrane inhibit the action of insulin on the insulin receptors. Thus making it difficult for sugar or glucose from the food we eat to enter liver cells, fat cells and muscle cells, where it is used for energy. This is the underlining cause of Type 2 diabetes. found in meats and animal products. Unsaturated fatty acids: Monounsaturated such as oleic acid found in olive oil: Oleic acid reduces the level of LDLs (harmful cholesterol) in the body that cause arterial degenerative disease and increase HDLs (good cholesterol), which protects the thin layer of flattened cells that lines the arterial walls. Polyunsaturated: This particular polyunsaturated fat is most healthful when consumed in plant based foods. They are good for the body because they reduce LDL (harmful cholesterol). Pumpkin seed, sunflower seed, and especial hemp seeds are an excellent source of Omega 3 and 6 fatty acids, which is needed to maintain a healthy heart and good blood circulation. Trans fatty acids: these are unsaturated fatty acids altered by heat or industrial processing. They are formed when frying with vegetable oils or when they undergo a chemical process called hydrogenation. This process is used by industrial food producers to prevent fats from becoming rancid and to produce semi-solid fats such as margarine by adding hydrogen atoms to an unsaturated oil. Because of the alteration, regular consumption of Trans fatty acids can also foster LDL (harmful cholesterol) build in the arterial walls. Thus it is just as harmful as saturated fatty acids.